The Command pattern is a great pattern for abstracting business processes from your implementation code. This pattern is becoming very popular throughout different types of systems. 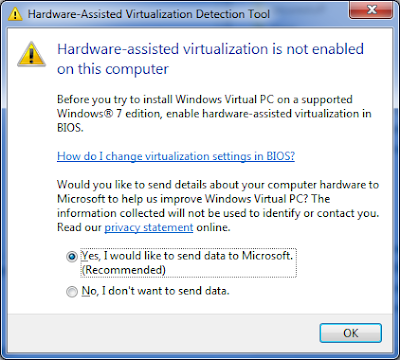 Whether this is MVC thin client, fat clients such as MVP, MVVM. The Command pattern works really nicely in combination with a IoC container and DI framework that I have talked about before on this blog. So our context here is a generic and is defined when the command is registered with the container. So imagine we have a CRM system that when a customer is registered, we want to send that customer an email to confirm he/she has been setup correctly. You might have a domain model in this case that raises an event that is caught on the middle tier. When this occurs, instead of baking that code into the presenter/controller/business class, you abstract it out into a command. This not only makes your system more readable/maintainable but makes it easier to test too. Very clean approach. Of course the more dependencies you add to the command, the more complex it will become which means harder to test. So sometimes commands can become over complex. Bear this in mind when adopting this pattern. In terms of handling errors etc, this could be handled via events using some sort of event aggregator pattern or the context itself to pass back data so the middle tier can act accordingly. I recently installed TFS 2010 RC x64 and only now got round to playing with it. I have to say once I got over the 'gremlins' during the installation everything else is pretty slick. There are many features I like and many that are going to make our lifes better. One of the really horible things I hated about VS 2008 and TFS 2008 was after a partially succeeded build, opening up the build output in Build Explorer would only tell you something went wrong. In other words, the build partially suceeded. What? what does this mean? we know from experience this generally means a unit test had failed, but which one, and how do I fix it? The only way to know which unit test had failed would be to troll through the build log - very painful when you have a large build script spanning multiple projects and 1000's of unit tests. I used to search for "FAIL". But some developers name their unit tests with the word "FAIL" in it so this doesn't help matters as it takes forever to find the real error. I'm impressed, this will make us so much more productive, a reason alone to upgrade. Excellent stuff! This post is really for my benefit (although it might help others). Here is a good article on the MVVM (Model-View-ViewModel) pattern that is showing a lot of interest in the WPF communities. It is very much a different way of thinking when designing UI architecture although very similar to Fowlers relatively new Presentation Model pattern. 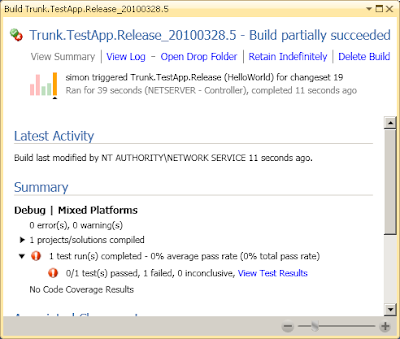 Windows Phone Developer Tools CTP now available!